Women's History at Wilson College: Elisabeth Scott Stam '28 Part 1. Elisabeth Alden Scott was the oldest of three sisters who were raised in China as the children of foreign missionaries and attended Wilson College. After graduating from Wilson in 1928, Betty completed a course of study at the Moody Bible Institute in Chicago. 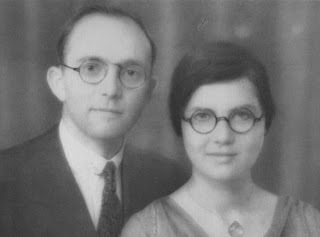 She married John Cornelius Stam on October 25, 1933. "BANDITS SEIZE WILSON GRADUATE IN INTERIOR CHINA"
"Word has come through the Associated Press in the last week of the seizure by communistic bandits of the Rev. and Mrs. J.C. Stam and their ten week old baby in southern Anhui province in China. By Thursday night, a report from the China Inland Mission revealed that the bodies of Mr. and Mrs. Stam had been found. No other details were given. 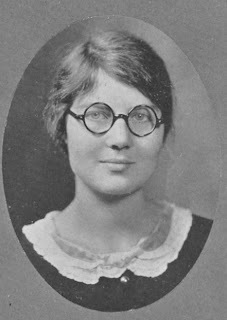 Mrs. Stam was Elisabeth Scott, '28, and a sister of Mrs. Gordon Mahy (Helen Scott, '30), and of Mrs. Theodore Dwight Stevenson (Beatrice Scott, '33); the latter was married early in September and sailed with her husband on the staff of the Hackett Medical College in Canton. Mrs. Stam's parents are Dr. and Mrs. Charles E. Scott, Presbyterian missionaries at Tsinan, Shantung. "Immediately after the China Inland Mission was advised of the seizure, the superintendent of the mission for Anhui province left for Nanking to help the American consulate release Mr. and Mrs. Stam. The foreign office wired the governor of Anhui province urging him to undertake a rescue expedition. "The Stams, who spent the summer in Anhui because of disorder in their own district, had but recently returned to their station in the town of Tsingteh. This has just been raided by Reds, presumably a portion of those defeated in Kiangsi province and scattered." "The story as finally disclosed in the papers of the tragic event which has cost the lives of Betty Scott '28, and her devoted husband, John Stam, at the hands of Communist bandits in China, has made an impression on the College community that will not soon be forgotten. It is safe to say that nothing from the mission field in recent years has so poignantly brought home what Christian consecration and Christlike heroism can mean. "By reason of the many close friendships of the present student body with Beatrice Scott '33, and among the more recent graduates of the College with Helen Scott '30, both undergraduates and alumnae, as well as the many members of the faculty who knew Betty here so intimately, will long continue to share with Dr. and Mrs. Scott, and with the members of their family, the intense grief and profound sense of loss which this tragedy has entailed, a sorrow mitigated only by the joy of knowing that their infant grand-daughter survived. "Faced in its stark reality what has actually happened seems scarcely possible of realization. it seems only yesterday that Betty herself was here, in the classroom, as a Student Volunteer, at her post in the Cabinet, and in her literary society; with her gentle and gracious presence exerting that quiet and pervasive influence for which she will always be remembered by those who knew her. To recall Elisabeth Scott to her own classmates is needless. To recall her to those who shared with her any one of the four happy years of her college life is to recall a presence so radiant of sincerity and of inward beauty that its memory can never be lost. "Perhaps what most alumnae will recall, aside from the gentleness of her demeanor, the fragrance of her loving affection and the grace of her literary expression, is the serenity and faith with which she lived among us; a serenity born of the deep peace of her own soul, and a faith that was founded upon a Rock. Values like this have not perished. Faith demands the acknowledgement that they have but moved on to higher and ampler fields of service. What Dr. Robert E. Speer wrote some twenty-five years ago of William Borden of Yale, "It seems impossible that all this strength and devotion can have been taken away from the work of the Church here below. Evidently there are missionary undertakings of even greater importance elsewhere." must be said of Elisabeth Scott and of John Stam."